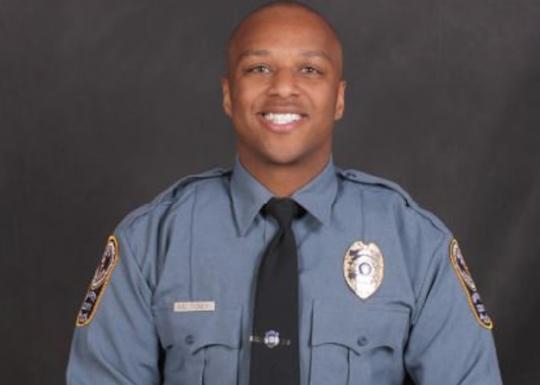 Two days after a Gwinnett County police officer was killed while investigating a suspicious vehicle, a manhunt ended in the death of suspect Tafahree Maynard, according to officials. The 18-year-old suspect faced charges of felony murder and aggravated assault after the Saturday afternoon death of Officer Antwan Toney. Maynard was found hiding in a shed behind a home on Monday morning and was fatally shot by responding officers after he refused to obey police commands, officials said. Officers tasered the suspect and then shot him after they determined he was displaying a weapon, officials said. On Saturday, the 30-year-old officer was responding to an anonymous 911 call of a suspicious vehicle near a school, possibly with individuals smoking marijuana inside. When Toney and another officer approached, the individual inside the car began shooting, and Toney was shot and killed, according to official reports. The individuals fled the scene, which triggered a manhunt for Maynard. Another man, 19-year-old Isaiah Pretlow, who was with Maynard during the shooting, is in custody and charged with aggravated assault, officials said. Pretlow was picked up Saturday evening for pointing a gun at another officer during the chase that followed the shooting of Toney, officials said. The visitation is set for Office Toney on Tuesday with a funeral to follow on Wednesday at Stone Church in Lawrenceville, Georgia. Toney's colleagues on the force knew him as a "very jovial person who was dedicated to his job and dedicated to his community." He had been with the department for nearly three years. On Saturday, the Gwinnett Police Department tweeted "Ofc. Antwan Toney was killed in the line of duty while investigating a suspicious vehicle. His 3 year anniversary with the department would have been in 6 days." This entry was posted in Culture and tagged Georgia, Police. Bookmark the permalink.